There’s nothing like a good cup of mud to get you going. Personally, I enjoy coffee at pretty much any time of the day or night. I prefer it strong and unadulterated by cream or sugar. And the $299 Behmor Brewer ($278 at Amazon as of this writing) makes the best coffee I’ve ever tasted—from a drip coffeemaker, that is. The Behmor Brewer makes a much better cup o’ Joe than the last Wi-Fi-connected coffeemaker I reviewed, the Mr. Coffee Smart Coffeemaker, and it’s endowed with many more features that will appeal to coffee geeks than that smart appliance. A smartphone app lets you control the brewing process, and you can use pre-programmed recipes to prepare coffee to your taste. The Behmor Brewer sports a stainless steel water reservoir, but there’s nothing to filter minerals and other impurities from the water you use. When you’re ready to make a pot of coffee, choose from three broad categories: Brew, Buzz, or Craft. In each case, you inform the app how many cups you intend to brew (6 or 8). Use 14 tablespoons of ground coffee to make eight cups, or 10 tablespoons to make six. Choose the Brew setting if you’re in a hurry, as the only other information you need to provide is whether you’re using light-, medium-, or dark-roasted beans. If you pick the Buzz setting, you’ll see recommendations tailored to your brewing preferences. Do you like coffee strong enough to chew? Pick a dark roast. Prefer something sweeter and fruitier? Start with African beans. Medium-roasted beans will yield a creamier cup. You’ll also find profiles for coffees purchased from big-name producers such as Dunkin Donuts, Peets Coffee & Tea, and Starbucks (these are labeled as “sponsored” recipes). LEDs are useful status indicators, but they’re a source of annoying light pollution when they get this big. Besides the bean choices, the Buzz brews are pre-programmed with different brew temperatures and pre-soak times (the coffeemaker will release a small amount of heated water into the grounds cup to allow the grounds to “bloom” before the extraction process begins). As the name implies, the Craft setting gives you the most control over the brewing process. Here you choose your preferred brewing temperature (within a range of 190 to 207 degrees Fahrenheit), and you get to set the presoak time (from 15 seconds to three minutes). In all three situations, you can either start the brew cycle immediately or set it to kick off any time within the next 24 hours. A showerhead-type emitter drips water over the entire top of the grounds basket to evenly soak all of the grounds. I was surprised, however, that Behmor chose a basket-type filter over a cone (a gold filter basket comes in the box). With a cone filter, the grounds stay in contact with the water longer. But perhaps the combination of the showerhead and the pre-soak cycle make up for it. In any event, the Behmor Brewer produced excellent coffee that was lacking in just one area: It didn’t have that thick layer of crema that makes the first sip from a pressure-extracted cup of coffee so delightful. Like the Char-Broil Simple Smoker I reviewed in February, Behmor uses the Dado Internet of Things platform to connect itself to your Wi-Fi network. Once you’ve downloaded the Behmore app, you link your smartphone to the coffeemaker’s network and then configure the app to connect the coffeemaker to your Wi-Fi router or access point. This takes just a couple of minutes, and you need to do it just once. Each time you launch the app, however, it takes more than a few seconds—on the order of 15 to 20, in fact—for the app to connect to the coffeemaker. While you wait, the app displays a message that suggests the coffeemaker has never been set up at all. That can be alarming the first couple of times, especially when you wake up bleary-eyed and in desperate need of a caffeine fix. Being a drip coffeemaker, the Behmor Brewer has a few other drawbacks, too: You must grind the beans and fill the water reservoir before you brew each pot, and then you need to clean the grinds basket and the thermal carafe when you’re finished. It’s also missing one other important feature: It has no water filter and there’s no option to add one. A coffeemaker with a basket filter would typically earn an automatic thumbs down. Not this time. The Behmor Brewer makes great coffee, but it doesn’t quite measure up to what you’ll get from an automatic espresso maker, such as the $700 Krups EA815050 Essential Espresso machine (available at Bed Bath and Beyond) I reviewed in April. On the other hand, that type of appliance can prepare only one cup of coffee at a time, and you could buy two of Behmor’s machines and have money left over for a few pounds of premium beans for the price of that Krups. 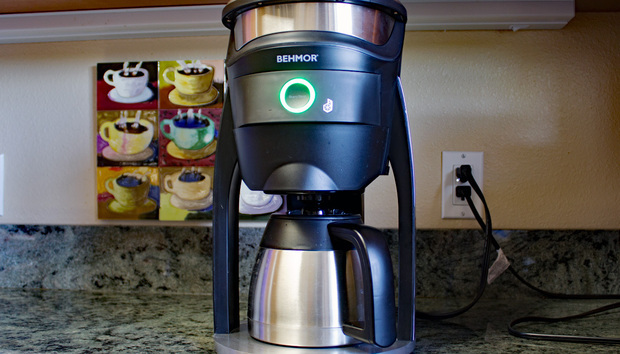 If you’re in the market for a drip coffeemaker, the Behmore Brewer is an excellent choice. While it has most of the limitations of its drip competitors, it delivers coffee that’s richer and more flavorful than anything I’ve tasted from a drip machine—even if you choose its semi-automatic setting.